Well, for the K and K family members, 2014 is the year we commit to healthy eating! Kelsey is leading the way for us as she switched to clean eating back in June and she finally convinced us to change our eating habits! In December, Kelsey lead a group of seven family and friends in a Holiday Challenge of healthy eating and fitness to help us ward off the holiday weight gain. I am happy to report that all of us were successful in actually losing weight in December. First time ever that I came to the New Year actually losing 4 pounds instead of gaining. So, we all committed to doing the month of January and we added more family and friends and we are a group of 30! Some are using the Vemma Chris Powell Bode products and carb cycling and some are doing their own programs, but all are getting the fantastic daily emails from Kelsey and support of our FB group! This month has produced even greater results with our average weigh loss over 4 weeks was 8 pounds per person. Amazing to think at my age (50+) that I would be a part of the latest craze called social dieting. It is so much fun. Kelsey will be leading a new group starting on Feb. 7th. If you are interested in learning about the February challenge, contact Kelsey. Tim and I just got back from five days of skiing with friends. Each morning one couple was assigned breakfast for the group. I knew that I wanted to make something that was hearty but healthy. 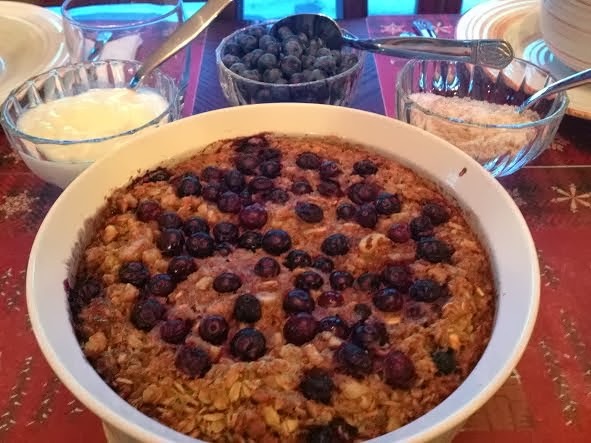 So this great recipe of Blueberry-Banana Baked Oatmeal was my choice. The recipe contributor assured that it “would help power you through your day and guard against energy fluctuations.” Our group of skiers agreed that it was delicious and indeed gave them lasting power until lunchtime. I made a few adjustments to recipe to up the protein level and served it with Greek yogurt and fresh berries! It made great leftovers so your breakfast is ready for the week! 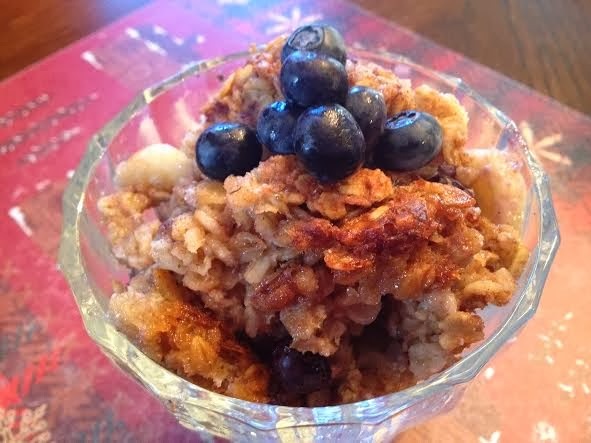 In a medium bowl, combine the oats, half of the walnuts, baking powder, cinnamon, salt, protein powder, and flax seed. Set aside. In another medium bowl, combine honey, milk, eggs, butter or coconut oil, and vanilla extract. Set aside. Arrange the bananas in layers on the bottom of the baking dish. Place 1 ½ cups blueberries on the top. Cover the fruit with the oat mixture. Slowly pour the milk/egg mixture over the fruit and oats, making sure it covers them completely. Sprinkle the remaining berries and walnuts on top. Bake for 35 to 40 minutes or until golden brown and the mixture has set. Remove from the oven. Let cool for 5 to 10 minutes before cutting. Storage leftovers in refrigerator.